Bobbins are one of the four necessary components for sewing. You need a bobbin in order for a stitch to form and the bobbin needs to be the right style for your machine. Whether you are sewing on a home machine, quilting on a longarm machine, or embroidering on a 10 needle machine, each machine type needs a bobbin. 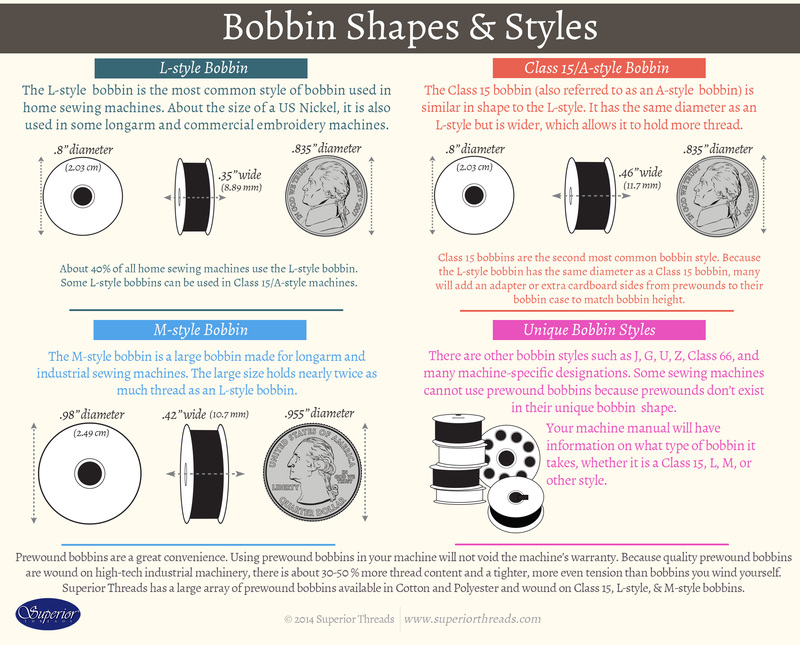 We created an insightful infographic that explores the details of the three most commonly used bobbin styles: Class 15, L-style and M-style. All sewing machines are designed to only use one style of bobbin. Some machines have a unique bobbin hook and will require the use of a special bobbin, only available for that machine. Click on the infographic below to view a printer-friendly version. Prewound bobbins have grown in popularity over the past several years. The convenience of not having to wind your own bobbins is what makes prewound bobbins so valuable. A typical prewound bobbin will have between 20% - 40% more thread content compared to a self-wound bobbin. This is because prewound bobbins are wound with advanced machinery at a high rate of speed. Most quilters and sewists prefer to match the color of their bobbin thread to their top thread. This is not necessary, but can help avoid obvious signs of uneven tension. Because the color of both threads are the same, it's difficult to notice if the top tension is too tight, resulting in pulling the bobbin thread up. Using a neutral-colored bobbin thread is also a popular choice, especially when using blending fabrics. View our lint-free bobbin thread, Bottom Line.